The Leading Ladies collection at Ellen Hutson is growing! This sweet plant lady has a green thumb…even though I don’t. (Hey at least I can on a card, right??) 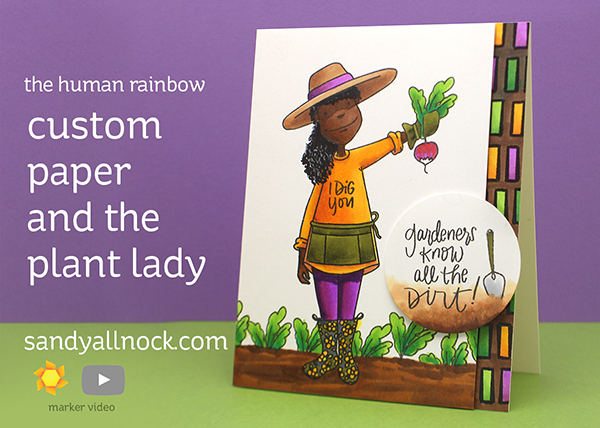 I’ll show you how I colored here in my #humanrainbow style, as well as creating my own patterned paper with some NEW papers from Ellen, too! (Colorable! woohoo!) Watch the video below, or click HERE to see it in HD on YouTube. A few more color combos, courtesy of Crafty Lady stamp set! 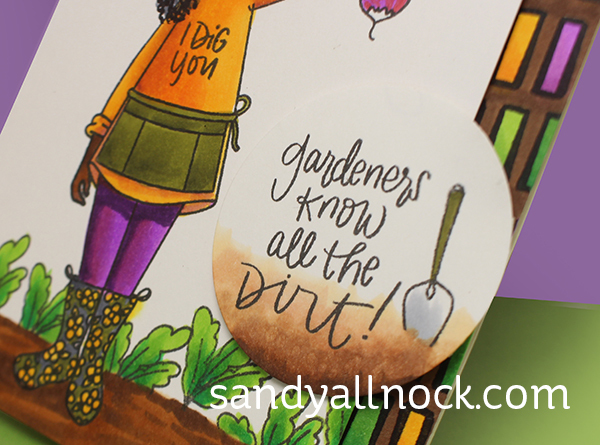 And one more share…last night I was playing around coloring a garden for the plant lady. 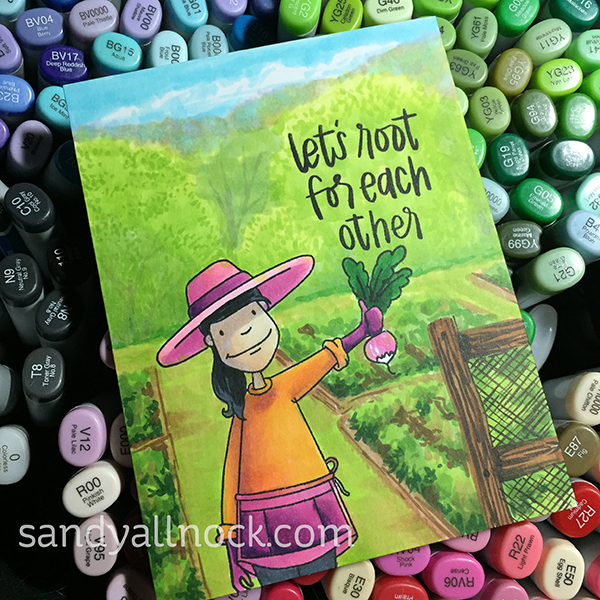 This is as good as my gardening gets – MARKERS! lol. You have my permission to match or not. Your card looks great as always. Love how you incorporate the human rainbow in so much of your work. It’s inspirational, as is your talent. So darned cute. I could (and I have!) 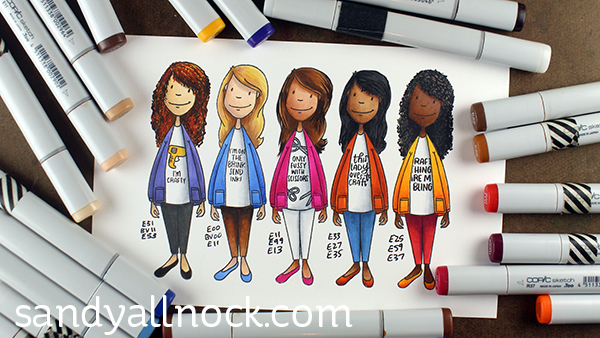 watch you colour all day. You are still my inspiration…I look forward each day for your video giving me perfect instructions on how to make a card. Your color choices are fantastic. Thank you for sharing such wonderful videos. I’m running out of adjectives to use for your artwork! So . . . let me just say that I watch the videos intently and get caught up in every little bit of it. I could spend the whole day just watching how you create art. Probably not the best idea since I really want to create some of my own. Watching you I’ve already made progress and I’m going to make more progress, you bet! Loved the rich colors!. . That garden card is FANTASTIC!!! I just can’t get over the amazing coloring-well done! WOW!!! Your coloring is gorgeous!! I LOVE the background you made on that last card!! I love your background garden – maybe one day you could video how you did it? GORGEOUS! Just like you and ‘all the shaded ladies’ – got me singing.